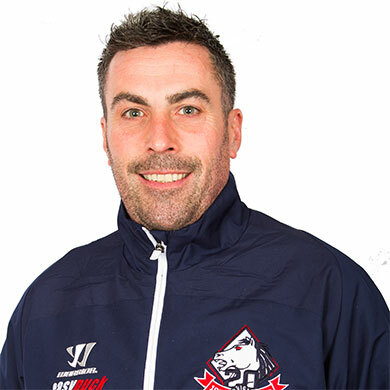 After icing for the club from 1997, forward Kevin Parrish inherited the coaching reigns from Phil Chard at the start of 2004/05 and has since gone on to establish one of the most successful coaching records in the UK. Under his guidance the Dynamos claimed six consecutive league championships between 2004 and 2010, whilst also scooping numerous cup and playoff titles, and he continues to chase further honours having extended his stay with the team for another year. Head Coach Kevin Parrish has won several personal accolades for his coaching success including recognition at the local Medway Sports Awards. At the inaugural ceremony in 2006, Parrish picked up the ‘Coach of the Year’ award after his side had completed the Grand Slam – winning the ENIHL Southern and National Titles, the Playoff Title and the ENIHL Cup. In 2008 Parrish was then recognised again as he picked up the Bronze Award in the same category. Kevin Parrish’s achievements have also been recognised by the English Ice Hockey Association (EIHA) who appointed him Under 13 South East England Conference Coach in 2006. Parrish’s recruitment was the first time a coach from the Dynamos’ organisation had been acclaimed by the sport’s governing body.